Full name, Mechanical hammer woodpecker, made by Gelma in Italy and sold by Gibson tool company. I trialled this tool for a day and absolutely loved it. In fact I now own one! The tool has a small motor which is suspended from a wall bracket or in my case a beam on my ceiling. The alternative was an air compressor with pipes, regulators and obviously the air gun. We used to use them for roughing out and cutting out old stone for replacements at the Cathedral so I am well aware of the usefulness of mechanical tools. However I don’t have the space for all of this equipment, also there is the noise to consider, the woodpecker tool is quieter and has less vibration-it also takes up a fraction of the storage space. 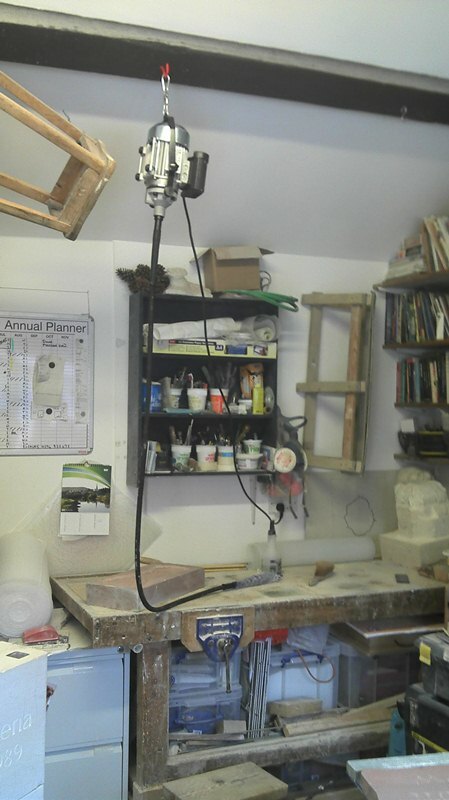 I am a keen advocate of carving everything by hand and hopefully my skill, training and experience come through in the work I create, but I want to start carving larger pieces in both Tetbury limestone and Forest of Dean sandstone, but the roughing out plays havoc with my shoulder and wrists and also takes a long time! As some of you are aware I have a piece I am currently working on which will have the whirls and hollows that I love to carve however it is about 3 cubic foot and needs a lot more work before I can start to refine it. These are the obvious good points, but I’m sure I will come up with more!! This tool can be used in both hands and unless you are ambidextrous it is very difficult to swap hands with the mallet and chisel. .
As I am based in a craft centre I am concerned about how much noise I make, I set the woodpecker up outside and tried the machine out on my large Tetbury piece. I asked some people about the noise, one lady commented that she didn’t actually notice the noise, she also wore a hearing aid and told me that there was no feedback of any kind. Obviously this is good news, I asked a second woman younger this time with a small daughter and again I received positive feedback. So far I have only spent 2 weeks carving my Tetbury piece and although I have managed to make good progress the work I did made an old shoulder injury flare up, using the woodpecker is not a replacement for carving by hand but an aid for it. I will be able to maintain the control over the chisels that I ‘plug’ into the gun of the machine, I can control how fast or slow and how much stone I remove in much the same way as I would with my mallet and chisel. I love to use Forest of Dean Sandstone in birdbaths and carvings, but it is so jarring and difficult to use, I generally have to start it off with the angle grinder-but then I am back to the noise issue, I used the woodpecker on a lovely dense piece of this Old Red, I don’t want to force the equipment, therefore it is only marginally quicker but I do know that it makes carving this stone much easier and again the control I have over the chisel-and obviously the knowledge of the material helps. I know that I will be carving more Wilderness red sandstone. I did try carving letters with the equipment and it is possible-again due to the control that one has over the chisel and with practice the letters would be as beautiful as if done with a hammer and chisel. I enjoy the quiet and simplicity of carving letters by hand however so maybe I won’t employ the machine for this part of my work! There is going to be some videos detailing the usage of the woodpecker and it’s plus points, I’m afraid you will have to wait for those!! Hello, i have been retired 3 years and started stone carving 2 years ago and i am a bit addicted. I love it and find it so therapuetic. I have been contemplating buying a “woodpecker for some time and I am slowly saving the money. I found your information so helpful particulary about the noise aspect. I am carving in a shed at the bottom of the garden and find angle grinders just too noisy.If you have any more information to share, I would be so grateful. I notice that Gibsons sell theirs for £700 plus vat and the Stone tool shop for £645:75 plus vat. Any thoughts about this. Thank you in antisipation David Singleton. Hi David, I’m hoping that my email reached you. In terms of price I can’t really help except there but advice I can give, make sure you have regular breaks and use anti-vibration gloves as although it has reduced vibration you would still need to protect yourself. have fun.